of back pain- mostly while changing positions (like getting up from bed or chair, turning in bed etc). She was being treated for the usual back pain by many of her doctors with painkiller medicines without any progress, until an MRI revealed that she had fractured a bone in her spine. This is the usual story of many women after their menopause. This is the story of OSTEOPOROSIS. General myth surrounding Osteoporosis is that it is lack of calcium in the body. However, Osteoporosis is more like non-availability of smooth roads for a good driving experience i.e. poor bone architecture in-spite of availability of calcium. Simply put, osteoporosis is a disturbance in the bony architecture. It is, as the word itself says a condition in which your bones become porous (osteo= bone). Bone strength accumulation in human beings is a time bound process. Upto the age of 30 you have the potential to gather as much bone mass as possible. This is called Peak Bone Mass. After that we start losing bone gradually year by year and it becomes more pronounced in the twilight years of our lives. This happens equally in males and females upto 45 years. In ladies, as menopause sets in, this loss of bone mass is even more pronounced which sets the stage for OSTEOPOROSIS. Men too can suffer from Osteoporosis but generally after the age of 70. Osteoporosis affects the spine and the hips most commonly. Bone density test followed by a few blood tests is one of the ways to assess your risk of developing Osteoporosis. Osteoporosis could be kept at bay by accumulating and improving your bone balance (like bank balance). It can happen if you start early in life. This happens by activities, importantly sports, which stress or impact the bones (skipping, basketball, gymnastics, dancing, jogging etc). Encouraging any outdoor sport has beneficial effect on the body. For rest, all is still not lost. In women as in men any weight training exercises do positively impact the muscles and bones. The training has to be supervised to avoid injury. We do encourage some weight training in women with osteoporosis too, apart from medicines. Calcium & vitamin supplements are not the treatment for osteoporosis. Post menopause get yourself evaluated for Osteoporosis regularly. Dr Uday Pawar is a Spine Surgeon, attached to Global Hospitals, Mumbai. He has close to 10 years of Spine related consulting and surgical expertise. His areas of interest are minimally invasive spine surgery, daycare spine surgery. He is also interested in the use of technology to help patients and doctors alike. Educating patients and helping them imbibe informed decision making process is what he likes. 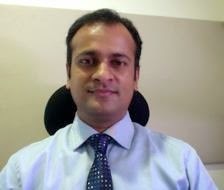 He also writes spine related blogs to help spine patients. He is a marathon runner and a trekker. October 4th, 2014: Bhanumati, a 43 year old lady from Bangalore came to our hospital with history of lump in her right breast since 3 months. She was told about us by one of her friends whose relative was treated by us. PET-CT (whole body scan) showed there was no spread of the disease anywhere else in the body. The size of her lump was very big. She was given an option of Organ preservation that means instead of mastectomy, she could undergo Neoadjuvant chemotherapy wherein Chemotherapy is given before the surgery. By doing so, we downsize or shrink the tumour. The patient who otherwise would have to undergo complete removal of the breast has now become eligible for Breast conservation surgery. Bhanumathi underwent 6 cycles of chemotherapy first. The tumour reduced to 2 x3 cms in size. She then underwent Breast conservation surgery with a Lattisimus dorsi flap cover to give a very good cosmetic outcome. Subsequently, she was given TrueBeam STx radiation therapy. 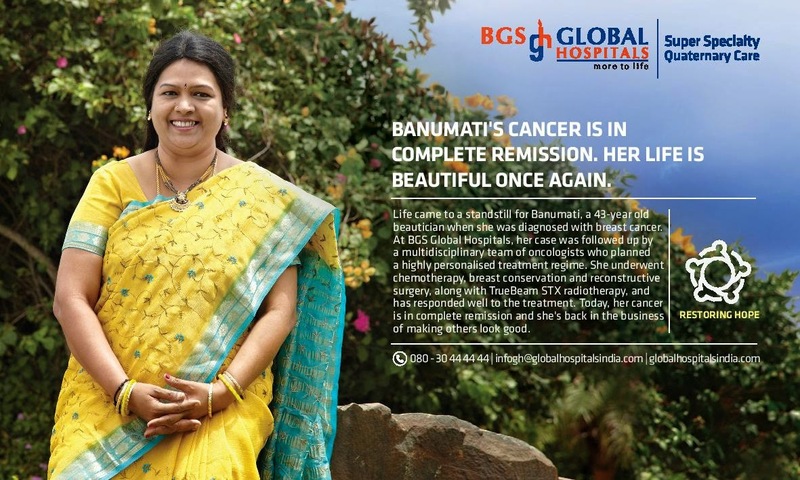 PET-CT after 6 months showed that Bhanumathi is in complete remission. Her disease has not only been cleared but her feminity also has been retained.